My friends, meet a thing of simple beauty: The Light Keeper’s Cap. 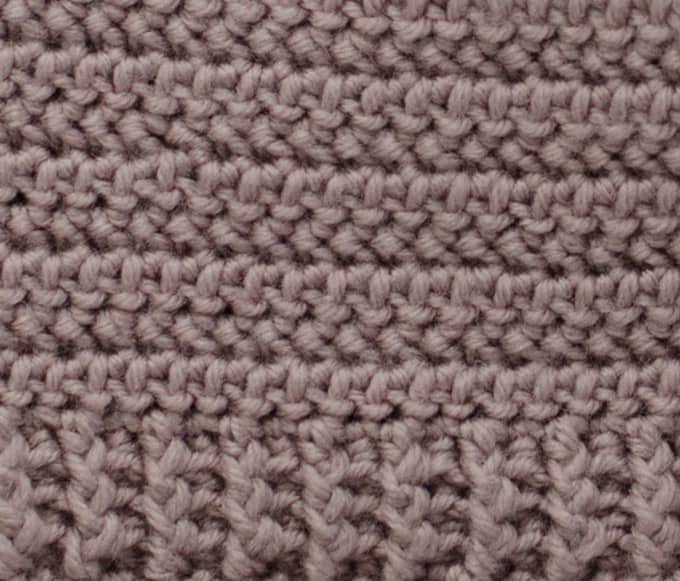 Ever since I learned the Herringbone Half Double Crochet stitch I’ve been wanting to make something special with it. Enter this Light Keeper’s cap. 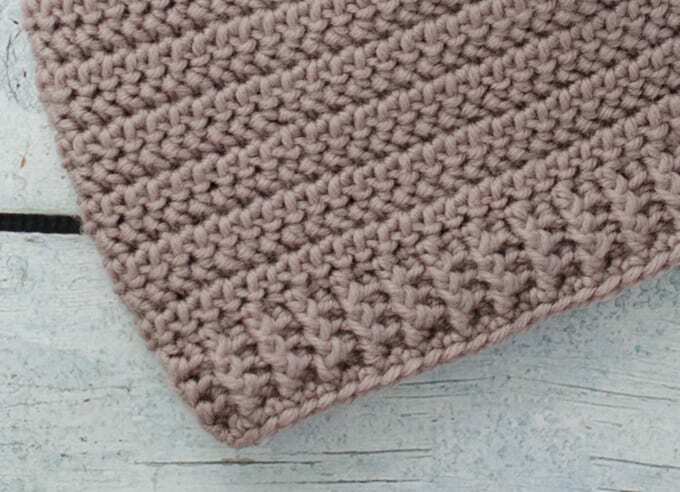 To achieve the amazing Herringbone texture, it is worked back and forth in joined rows. I used Red Heart’s Chic Sheep yarn. This high quality wool yarn is available from many well known retailers including Joann and Hobby Lobby. It is worsted weight, but is ever so slightly on the lightweight end of the scale. It has a beautiful drape that I just love. But because it is a bit lightweight, I found there were more stitches per inch than if worked with a heavier weight worsted weight yarn. 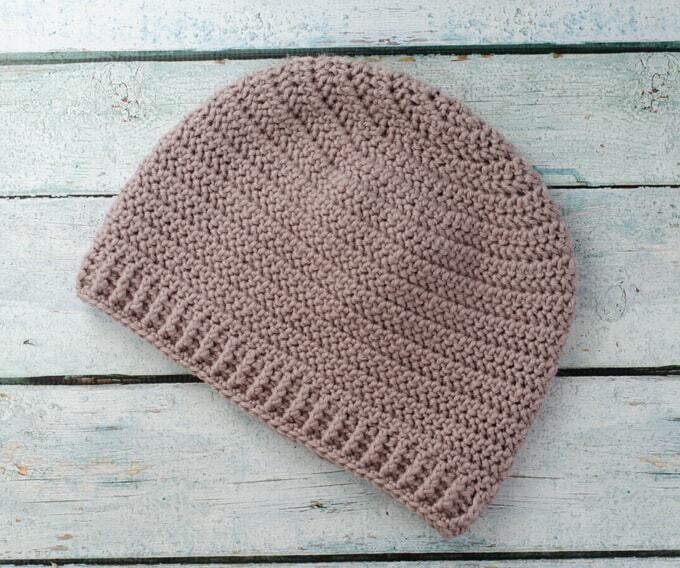 You can certainly make the Light Keeper’s Cap out of a regular, slightly thicker worsted yarn. But you may need fewer stitches and rows to achieve the same measurements. 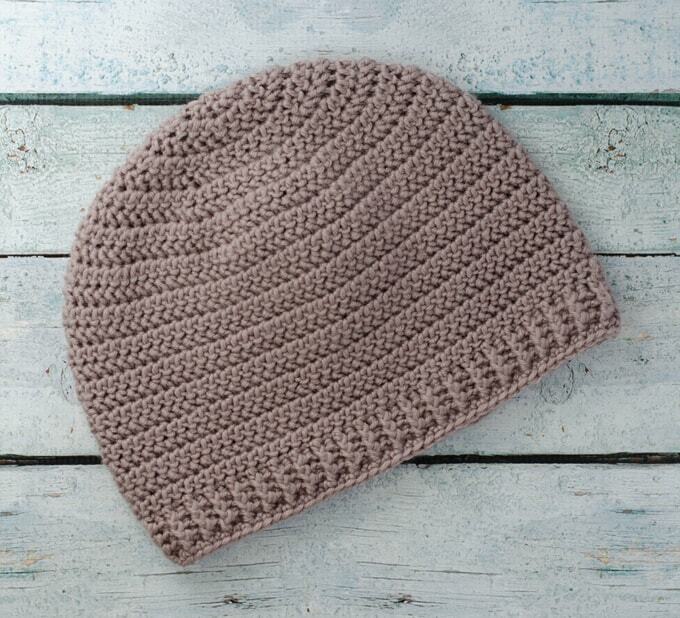 In fact, I’d recommend heading over to the Salt of the Earth Beanie and just use the Herringbone Half Double Crochet for a similar look. Now on to the Light Keeper’s Cap. As you may have noticed, I enjoy giving my special projects meaningful names. The Great Lakes Beanie is named after my beloved Great Lakes that surround my home state of Michigan. The Titan Tapestry bag is named after Titan, a puppy we encountered during our photo shoot. And the Happily Ever Afghan is named in honor of my son’s wedding. While working on the Light Keeper’s Cap, my husband and I found ourselves on an adventure–which happens quite often with us. I found an old sewing machine and cabinet online in need of rescue. While the cabinet was a perfect fit for my early 1970’s era Elna sewing machine, I was a bit reluctant to make a 2+ hour drive to get it. But when my sister offered to go halfsies–she would split the cost and take the sewing machine and I’d get the cabinet…well.. I had a mission. Thankfully I have a husband that enjoys gallivanting (as he calls it) and is willing to heave ho my finds into our SUV. So off we went on a foggy Saturday morning on our rescue mission. After the sewing machine was safely stowed, he insisted on “checking things out” in Port Huron, Michigan while I crocheted away on this lovely hat with no name. We were following the shoreline when suddenly.. we rounded a corner and saw THIS! 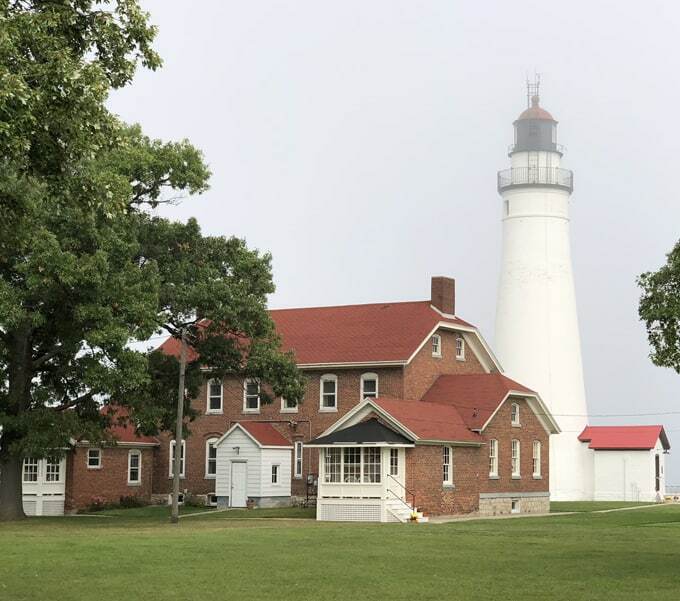 Fort Gratiot Lighthouse! We are huge Lighthouse buffs. On vacation we like to visit lighthouses and we even stayed in a Bed & Breakfast Lighthouse this past summer. But for whatever reason, on this day in Port Huron, neither one of us thought to look up area Lighthouses. And then suddenly, here was THIS lighthouse and in a flash our afternoon plans changed. And that is what I like best about the adventure. Never knowing exactly how things are going to turn out. But usually a surprise delight is in store when you take the time to just live in the moment and see where life goes. We took the lighthouse tour. I’m always amazed at the lives Lighthouse keeper’s led. Their job was to keep the light lit no matter the weather. And they often went out into horrible conditions at all hours to tend to their light. And that’s when I knew. I knew the name of this cap I was working on would be named for those brave men and women who tend to the lights that guide our way in the world. Soft, warm and cozy, I can almost imagine it pulled down over ears on a cold winter’s day. A little bit of warmth and comfort to make the job a little easier. The Light Keeper’s Cap is sized for a man, but can be easily altered to fit a smaller or larger head. Just stop increasing a row or two sooner if you’d like it smaller or add another round of increases if you’d like it a bit bigger. Want more men’s hat patterns? Click here for more free mens patterns! HHDC: Herringbone Half Double Crochet. Click HERE to learn how to do the HHDC. R1: 8 HHDC into ring (8 sts). Join with 1st stitch. Turn. Note: cap is worked in turned rows. Every row in the Herringbone pattern starts with a chain 2 and is joined at the end of the row with a slip stitch to top of the first stitch worked. R2: Ch 2 (does NOT count as a stitch, here and throughout). 2 HHDC in ea st around. Join with slip stitch to first stitch. (16 st) Turn work every row. R3: Ch 2, *HHDC in next st, 2 HHDC in next st, repeat from * around. Join with slip stitch to first stitch. (24st) Turn. R4: Ch 2, *HHDC in next 2 st, 2 HHDC in next st, repeat from * around. Join with slip stitch to first stitch. (32 st) Turn. R5: Ch 2, *HHDC in next 3 st, 2 HHDC in next st, repeat from * around. Join with slip stitch to first stitch. (40 st) Turn. R6: Ch 2, *HHDC in next 4 st, 2 HHDC in next st, repeat from * around. Join with slip stitch to first stitch. (48 st) Turn. R7: Ch 2, *HHDC in next 5 st, 2 HHDC in next st, repeat from * around. Join with slip stitch to first stitch. (56 st) Turn. R8: Ch 2, *HHDC in next 6 st, 2 HHDC in next st, repeat from * around. Join with slip stitch to first stitch. (64 st) Turn. R9: Ch 2, *HHDC in next 7 st, 2 HHDC in next st, repeat from * around. Join with slip stitch to first stitch. (72 st) Turn. R10: Ch 2, *HHDC in next 8 st, 2 HHDC in next, repeat from * around. Join with slip stitch to first stitch. (80 st) Turn. R11: Ch 2, *HHDC in next 9 st, 2 HHDC in next, repeat from * around. Join with slip stitch to first stitch. (88 st) Turn. R12- 25: Ch 2, HHDC in each stitch around. Join with slip stitch to first stitch. (88 st) Turn. Measure the cap from the crown through row 25. It should be 7.5″ long. Now switch to working regular half double crochet stitches (hdc) and do NOT turn after each row. R26: Ch 2, work a hdc in each stitch around. Join with slip stitch to first stitch. (88 st). R31: Ch 1, sc around. Fasten off and weave in ends. I like to use the invisible join to finish off the cap. Note: If you are making the Light Keeper’s Cap smaller or larger, work in even HHDC rows until the hat length is about 1″ less than the total length you desire. Looking for more men’s hat patterns? Click here for more free mens patterns! I love seeing your finished projects! If you share your Light Keeper’s Cap on Instagram, be sure to tag me @crochet365knittoo. If you are on Facebook, stop over to the Crochet 365 Knit Too Facebook page and share a photo! I’d love to see your work! Written pattern copyright Cheryl Bennett 2018, all rights reserved. Please do not reprint or repost this pattern. 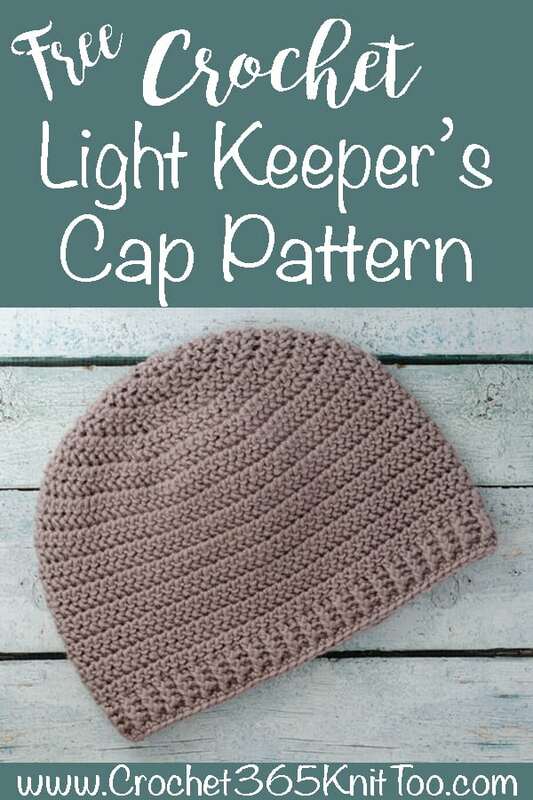 If you would like to share this Light Keeper’s Cap pattern with others, just link to this page. If you’d like to make items for sale from this pattern, please visit my About page for more information. I’ve never been to Europe, but I’d love to go and see those lighthouses!